Pressure washers can help you do almost any cleaning job around your home. Gutters are one place that most people put off cleaning, because it can be a time-intensive process of climbing up and down a ladder to clean out the gutters by hand. There are ways that you can use your pressure washer, in cleaning gutters with gutter cleaner. The gutter cleaner wands are specially made to help you clean those gutters from the ground, so that you will not have to go up and down a ladder all around your home. This extension can be easily attached to any pressure washer’s wand to allow you to use the spraying water to your advantage to clean all of the dirt and debris from your gutters. This can take you a lot less time than cleaning out the gutters using a water hose or by hand. Cleaning gutters with gutter cleaner extension has a curved neck to allow you to direct the water into the gutters to push the leaves and other debris out of the gutters. It gives you greater control than simply using your wand, because of the curved neck. 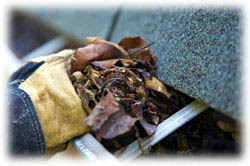 You will be amazed at the amount of debris that is in your gutters. You can use the gutter cleaner with any pressure washer. It is durable enough to handle up to 4000 PSI (pounds per square inch) as well, so this means that no matter how grimy and debris-filled your gutters may be, cleaning gutters with gutter cleaner should be able to get them clean and free flowing. The gutters are not the only place that this accessory will work, however. Cleaning pitched roofs will be made much easier and more efficient with this gutter cleaner. Cleaning engines from all sides, instead of just from the top will help to remove all of the dirt, oil, and grime off of your engine. You can also use the gutter cleaner to clean the eaves of your home without getting wet. All of these uses can help you to use your power washer more efficiently, increasing its function and value to you. A gutter cleaner can keep your gutters clean, so that the water is removed from the top of your home quickly and efficiently. This protects your home from water by directing the water away from your home and also protects your foundation from too much water exposure. During the winter months, removing the debris can help to keep the sidewalks free from ice, because the water will flow properly through the guttering system and will not overflow onto the sidewalks below. By using your gutter cleaner twice a year to remove all of the debris from your gutters, you should be able to keep your gutters working as they were designed to. If your gutters are overflowing with leaves and other debris, then purchase a gutter cleaner to use with your power washer. It can make cleaning that area of your home much less tedious and stressful. You can stay firmly on the ground, too. This can save you time and energy.